Boopshis. 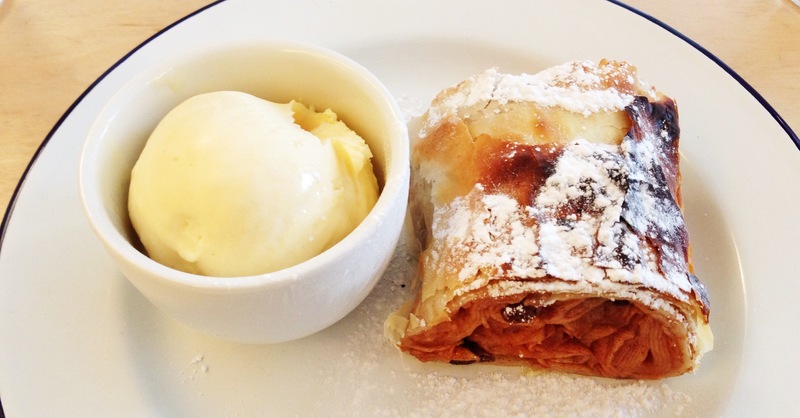 A labour of love, for two brothers with an Austrian heritage. The word Boopshis a term of endearment used by their grandparents, who left them some money, which they used to do this. Sweet. It was a drab Sunday and we wanted some comfort food. C was all set for schnitzel at the Wolseley but I fancied something a little more casual. Windmill Street is just off Tottenham Court Road. Not in Soho, where my brain keeps placing it, but just near Charlotte and Goodge Street. They haven’t spent a fortune on the fit out. Plasticky entrance, stripped-back white interior and basic furniture means that this isn’t a place to while away the day. I also suspect it can get very noisy in the evenings, when full. It was, however, practically empty on the day that we visited, just after new year. I didn’t venture down to the bar. Another time. It’s all about the schnitzel and the spritz, (a wine-based cocktail, prepared with prosecco) but, on a wet Sunday lunchtime in January, it was just about the schnitzel. Here, A choice of three: rose veal, chicken and rare-breed pork. The most expensive choice is the veal, at £14.50. 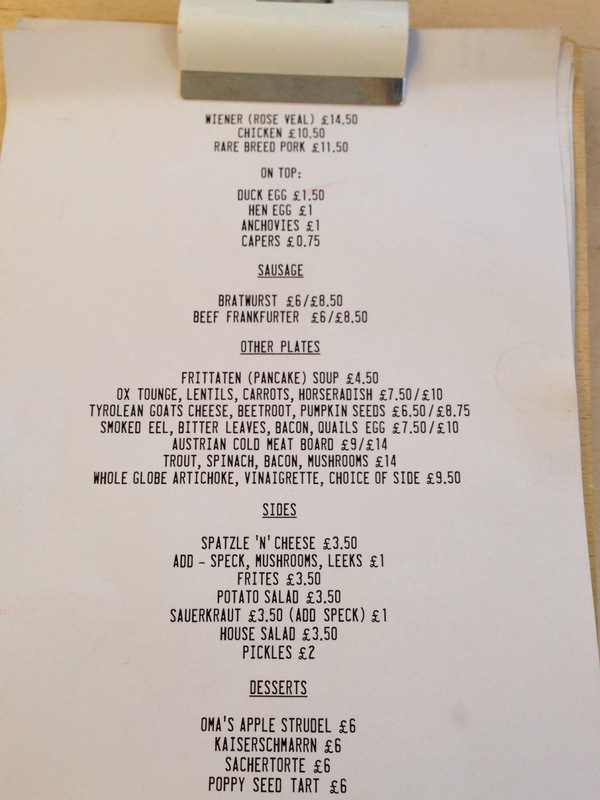 You can have different toppings, duck or hen egg, anchovies and capers. I plumped for the capers. I regretted it later. 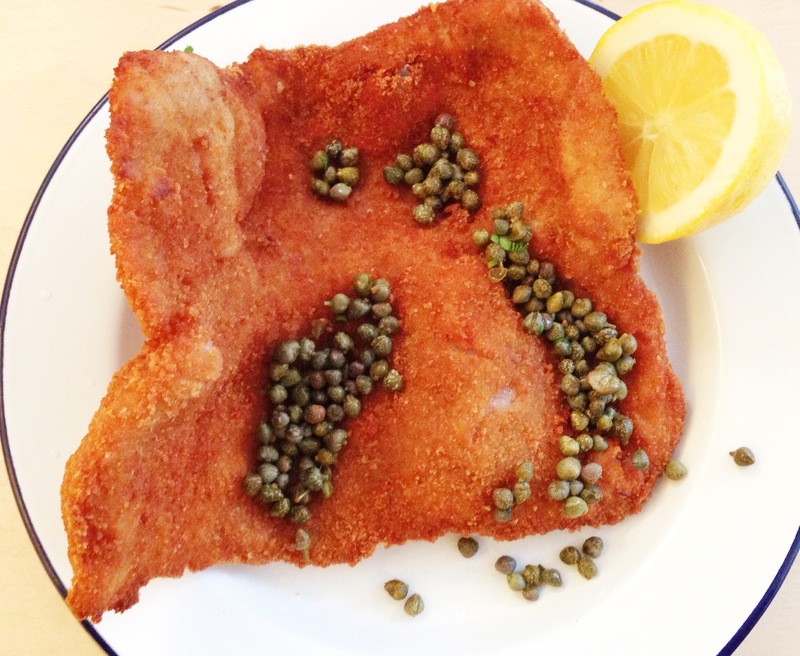 The schnitzel was served plainly, deep-fried in breadcrumbs, on an enamel plate. Capers scattered over. The rose veal was slightly dry. Copious squeezes of lemon juice did not really help. Melted butter might have done. I’ve had some really outstanding wiener schnitzels – this wasn’t one of them, sadly. It was pleasant, but I think I prefer a pan-fried to a deep-fried version. The place is, however, fun and the service extremely friendly. I managed to inhale one of those little capers down my windpipe and through my nostrils simultaneously, which is a trick I probably could not repeat. I wouldn’t recommend that you try it. I think that you have to be eating and talking at the same time. Obviously something I never do. 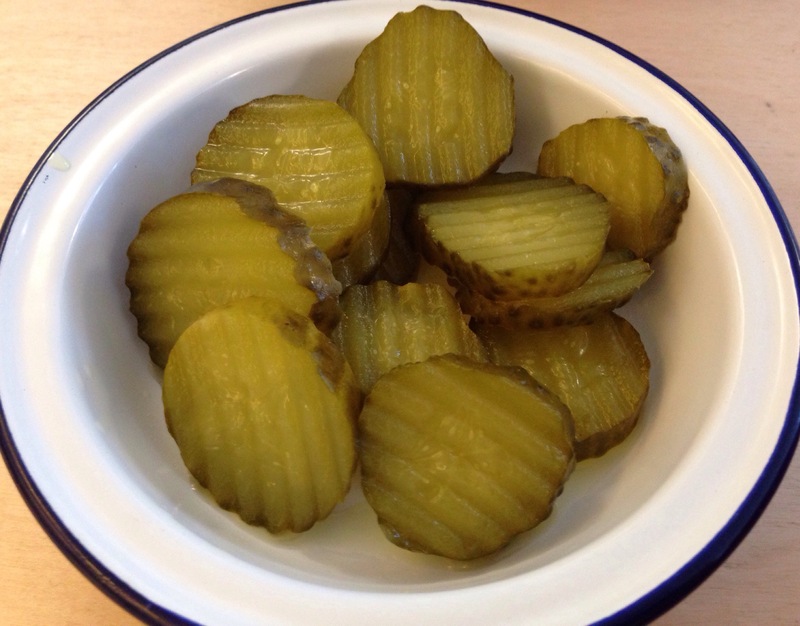 The side dishes of pickles – if I was being uncharitable, I would say that they had come straight out of a Krakus jar and none the worse for that. 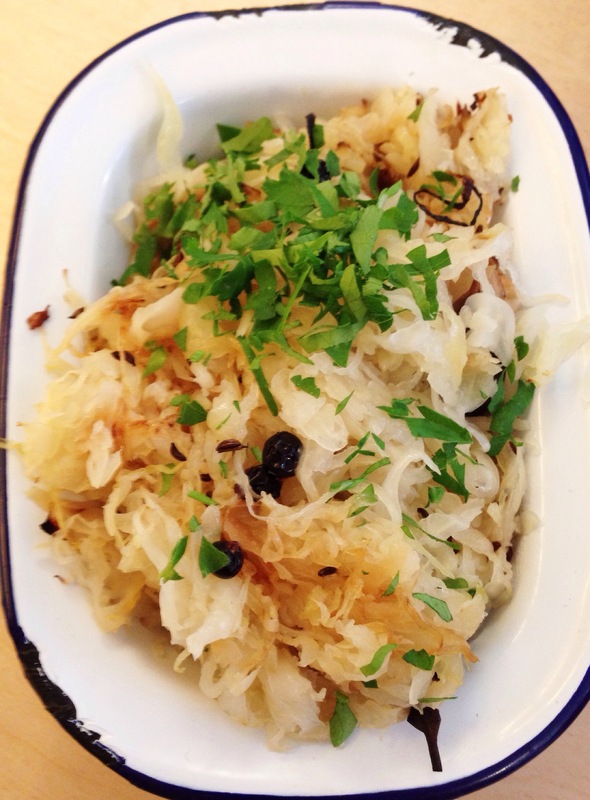 The sauerkraut was, unexpectedly, served warm, but had no bite to it at all. I would much have preferred a traditional cold, sharp sauerkraut, which is what I was expecting, to cut through the richness of the deep-fried schnitzel. The spätzle with cheese or, as it is on the menu, spatzle’n’cheese, presumably a play on the currently modish mac’n’cheese is a stodgy side, of the type that normally speaks to me . According to Wikipedia, the word spatzle is a diminutive of Spatz, meaning little sparrow (I have no idea) and is a type of egg noodle or dumpling of soft texture found in the cuisines of southern Germany, Austria Switzerland, Hungary, Alsace and South Tyrol. Now you know. 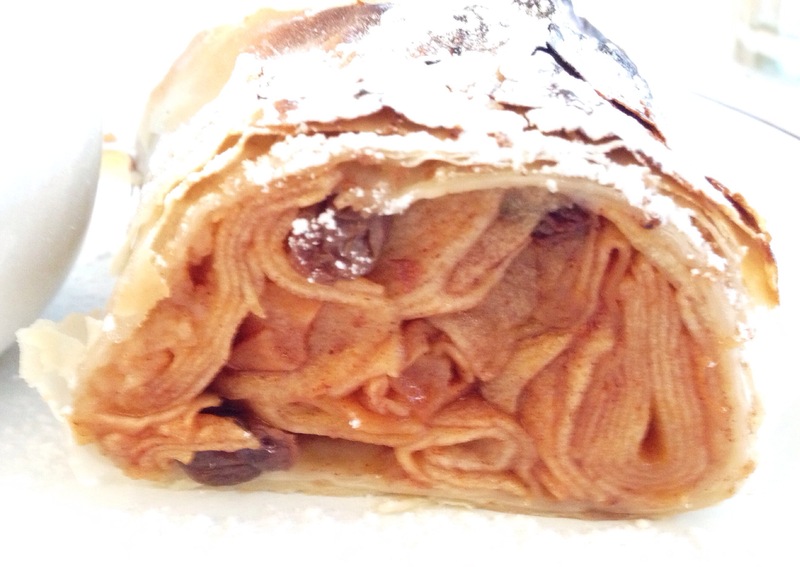 Here, it was a cross between pasta and bread. Pleasant, but there needed to be some more depth of flavour in the sauce, because it was quite stodgy and bland. 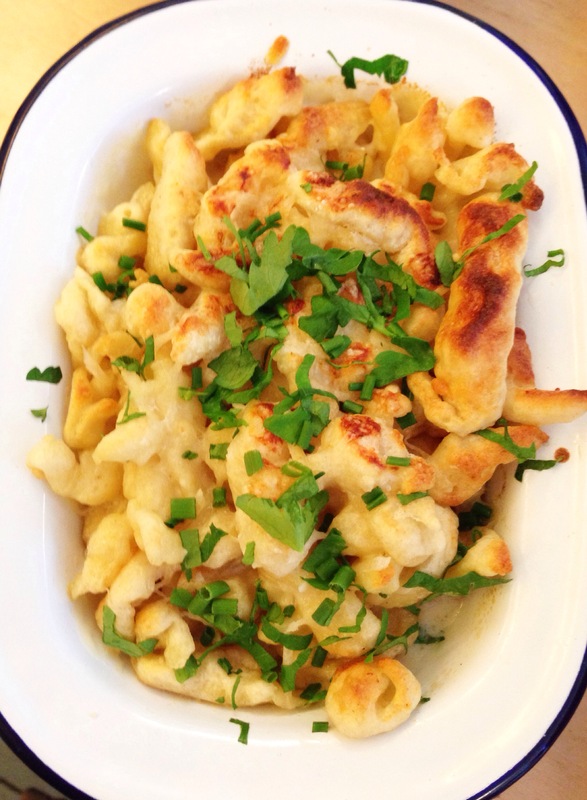 If you’re going to make it into an Austrian version of mac’n’cheese, you’re going to need more cheese. Because there will be a next time, as I do like schnitzel and here, the prices are sensible – not cheap – but they do make an effort and it is the sort of place that I would quite happily come to after work, for one of those interesting prosecco cocktails and schnitzel. Fast-food, from the old country. Cukes, as we call them in my world. Should you want a drink…. 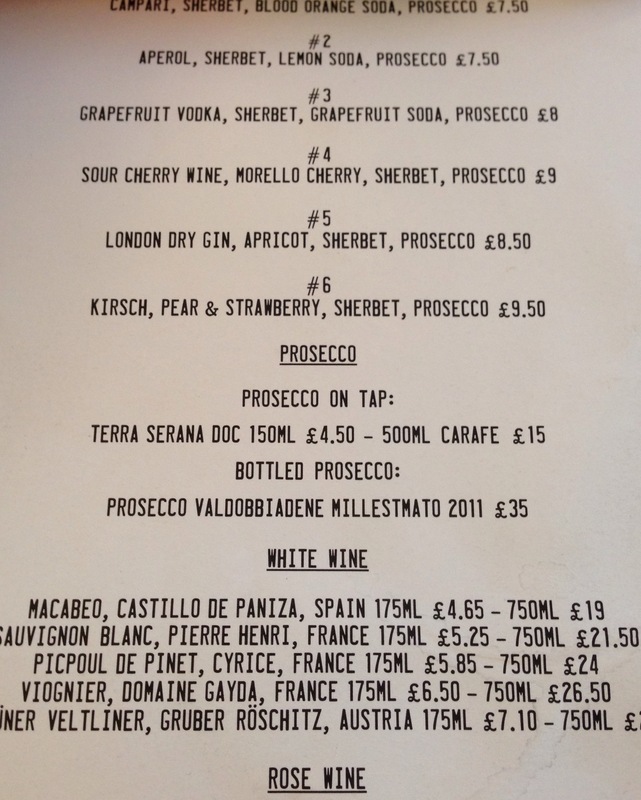 “Prosecco on tap”. How marvelous – could I get that in my kitchen, do you think? My thoughts exactly Sarah C!